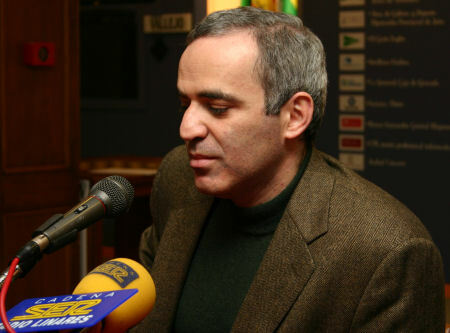 3/10/2005 – The winner of Linares and the world's strongest chess player, Garry Kasparov, has just announced his retirement from professional chess. His games in this tournament were the last in a career that has spanned thirty years, twenty of which were spent on the top of the world ratings list. Here are details and a video clip. At the press conference after the Linares tournament Garry Kasparov, the world strongest player and leader of the world rankings for twenty consecutive years, stunned the public and journalists by announcing his retirement from professional chess. He had revealed this decision to his closest friends just before the announcement, which was originally planned for the closing ceremony the next day. But after his loss in the last game (of his professional career) to Veselin Topalov he decided to get it out of the way on the same evening. Garry's mother Klara Shagenovna Kasparova was present at the conference, with tears in her eyes. "We have been going to tournaments for thirty years now," she said, "and this is the last time." A number of colleagues and journalists also had trouble hiding their emotions. We have taped the entire press conference and will bring it to you as part of ChessBase Magazine. Below is a small section from the very beginning, with Kasparov's formal announcement. 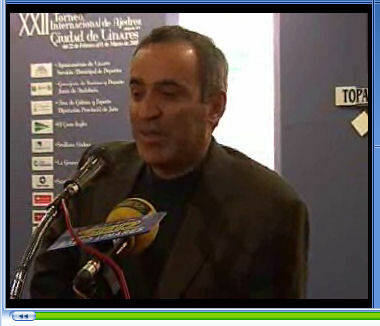 In the opening section Garry Kasparov says: "I would like to make a short statement before the press conference. It could come as a surprise to many of you. But before this tournament I made a conscious decision that Linares 2005 will be my last professional tournament, and today I played my last professional game. I hoped I could do better in my last game, but unfortunately the last two games were very difficult for me, to play under such pressure, because I knew it was the end of a career which I could be proud of. I may play some chess for fun, but it will no longer be professional competitive chess." My Great Predecessors. The project is expanding every year, and I want to spend more time on that. Also, by the end of this year my new book will appear, in fifteen languages, including Spanish of course, but also in Chinese and Japanese. The tentative title of the book is How Life Imitates Chess. It is a very important project because I want to demonstrate to a mainstream audience how the game of chess can explain the decision-making process in many walks of life." Was he considering going into politics? "I devote a certain amount of time to Russian politics, as every decent person should do, who opposes the dictator Vladimir Putin," he replied. Finally, when asked if he could see anyone in the chess world to replace him he thought for a moment and then mentioned Karjakin and Carlsen. But time would have to tell whether they could make a big impression on the chess world as Fischer and he himself had done. What can we say? 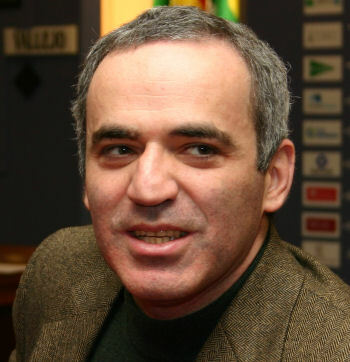 Thank you Garry Kasparov for thirty years of great chess!